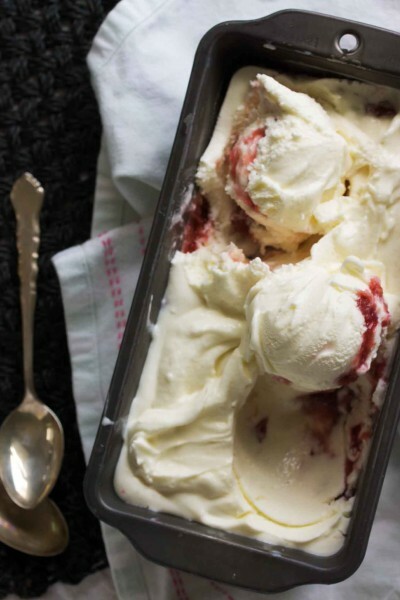 This ice cream is a perfect way to ring in late spring/early summer. It’s an impossibly smooth, creamy orange-scented ice cream, swirled with a gingery sweet-tart rhubarb sauce. I served it alongside a stack of my favorite chewy ginger cookies, but licked from a cone while dangling your feet off the end of a dock would be just as good, if not better. For the ice cream base, I tried a recipe I’ve been meaning to try for years, but especially after a friend brought me a scoop he had made to taste. It’s from the Jeni’s Splendid ice cream cookbook and it’s a little different from ice creams I’ve made in the past. Instead of eggs, it’s thickened with cornstarch and cream cheese (or Mascarpone). A bit of corn syrup sweetens it and also prevents ice crystals from forming, yielding an ice cream that is the perfect consistency–smooth and creamy, not the least bit icy or grainy like so many other recipes for homemade ice cream. To start, combine milk, cream, sugar, corn syrup, and a pinch of salt in a saucepan and bring to a boil. Add an orange peel and boil for a few minutes. Make a slurry with cornstarch and milk. Add the slurry (I should really find a more appetizing word to use here…) to the boiling milk and cook until thickened. Now put a few tablespoons of cream cheese or Mascarpone in a bowl and whisk in the hot milk mixture. Chill. Next, we’ll make the rhubarb swirl. Chop a few stalks of rhubarb and combine with sugar, freshly grated ginger, and a squeeze of orange juice in a small saucepan. Cook until the rhubarb has broken down and become thick and saucy, chill. When the ice cream base has chilled completely, churn it. I use the ice cream bowl attachment for my kitchenaid mixer–it’s super easy, but I do kind of miss the beast of an ice cream maker that my family used when I was a kid that you had to pack with rock salt and that required the use of earplugs within fifty feet. 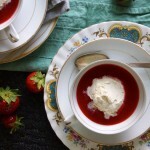 After the ice cream has churned, layer with the rhubarb sauce in a shallow container. Pop it in the freezer and let the ice cream set up for a few hours. When the ice cream has set up, grab a scoop and dig in. Hello summer, welcome back! We’ve missed you. Serve the ice cream with Triple Ginger Cookies to really accentuate the ginger flavor. Don't have time to make homemade ice cream and cookies? Try crumbling a few store-bought store-bought gingersnaps over the top. In a small bowl, stir together ¼ c. of the milk and the cornstarch; set aside. In a medium saucepan, combine the remaining milk, cream, sugar, corn syrup, and salt. Whisk to dissolve the sugar and bring to a boil over medium-high heat. Add the orange peel and cook for 4 minutes, stirring often and lowering the heat slightly if the milk starts to bubble over. Add the cornstarch slurry and continue to cook until thickened, about 2 minutes. Remove the orange peel. Place the cream cheese or Mascarpone in a medium bowl. Pour in ¼ c. of the hot milk mixture and whisk until smooth. Whisk in the remaining milk. Cover the bowl and chill until completely cold. If you want to speed the process, pour the mixture in a large zip-lock bag, seal, and submerge in an ice bath. 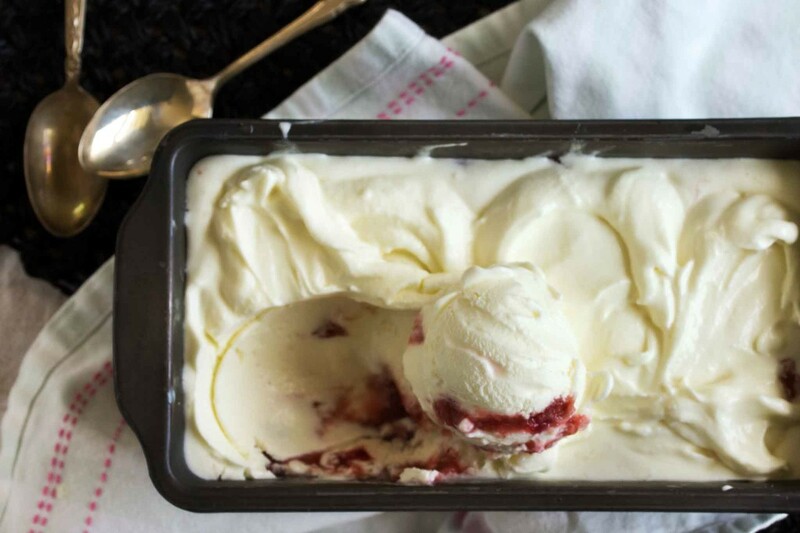 While the ice cream base is chilling, make the rhubarb swirl. 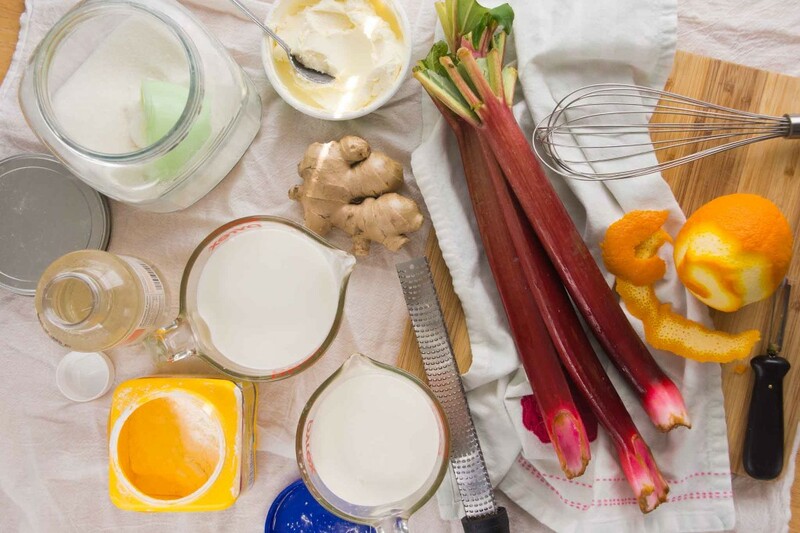 Combine the rhubarb, sugar, grated ginger, and orange juice in a small saucepan. Cook over medium heat, stirring often, until the rhubarb has broken down and the sauce has thickened, about 10 minutes. Transfer to a small bowl and cool completely. When the ice cream base has completely chilled, pour the mixture into an ice cream maker and churn according to the manufacturer's instructions. After the ice cream has been processed, spread about a third of it in a loaf pan or shallow plastic container. Spoon about half of the chilled rhubarb sauce over the ice cream, repeat, finishing with a layer of ice cream. Cover and freeze until set. Thanks, Cheryl–hope it was a success! Oh yes! As an honored member of the unofficial “tasting committee” I can highly recommend this! (Cookies were great, too!) You can go out on the boat with us all you want…as long as you bring ice cream and cookies! 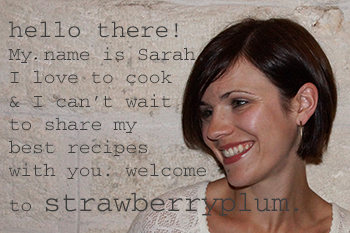 And you’re more than welcome to borrow the noisy ice cream maker – I still love it! What a gorgeous flavor combination! Your description of poolside ice cream bliss made me want to pull out my maker immediately, especially for such a novel recipe. I am very intrigued by the flavor combination of spicy and tart. What a perfect duo to pair with the cool creaminess of the ice cream base. Yes and you should!!! I don’t know why I don’t make ice cream more often! This ice cream is gorgeous! 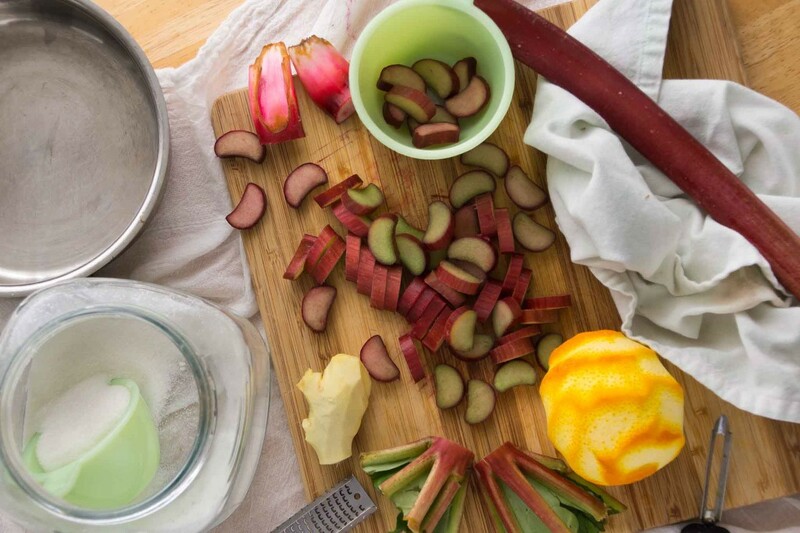 Ginger and rhubarb is such a great combination. Also, super jealous of your cherry tree!! Thanks, Andj! 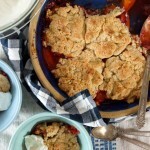 I love the combo too–can’t wait to use ginger and rhubarb together in some savory dishes coming up! I tried this recipe and it was the best homemade ice cream I have ever made. I made chocolate chip cookie cups to put this in as well (probably would’ve been great as ginger cookie cups). Thanks a lot :). One thing to admit, I didn’t want to buy an entire bottle of corn syrup so I replaced it with 2.5 tablespoons of regular sugar and it was still great. 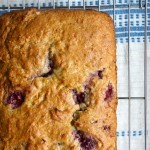 This recipe is wonderful. Yesterday I served a selection of ice creams from Jeni’s ice creams book and this one. Al the ice creams were good but the ginger and rhubarb was the big hit–none left for us to snack on. The first time I made it, I was apprehensive because the ginger is so spicy but it was amazing. 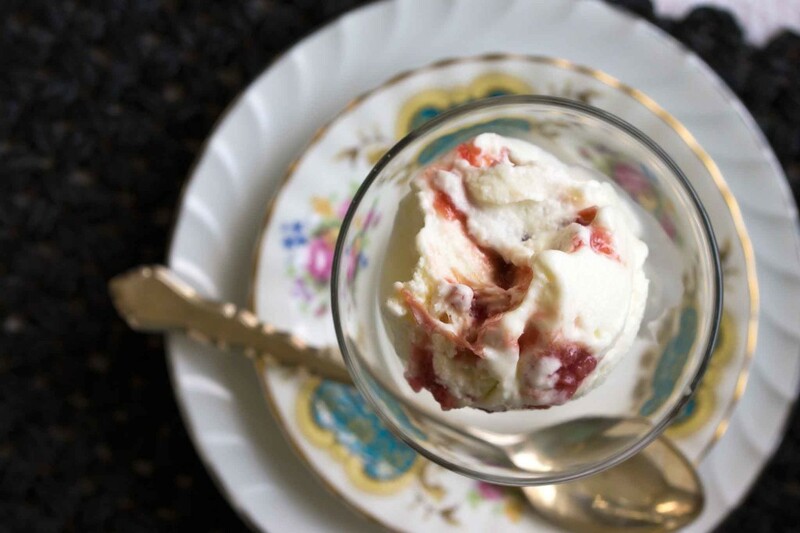 The subtle orange flavor in the ice cream is a perfect compliment to the ginger and rhubarb swirl.